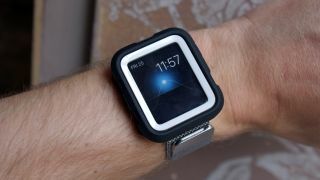 How much would you pay to make your Apple Watch look like this? It's a familiar tech conundrum: you spend oodles on fancy gadgetry, then start worrying that you're going drop, scratch or otherwise damage it, and so you have to decide whether to show off its stylish looks and risk it taking a knock, or play safe and hide it away. It's why iPhones are locked away in soulless case prisons, obscuring their smooth metal chassis. You'd think that things that aren't being tossed around would be safe, but the Apple Watch has been given the same treatment our smartphones are subjected to, namely being surrounded by rubber and plastic in the hope of keeping it safe from our own carelessness. I've been trying out the Griffin Survivor Tactical Tough Case for the Apple Watch, which is designed to keep your expensive digi-timepiece safe. Coming in at £25 / $30 / around AU$40 it's another expense on top of the hundreds you've already shelled out for the Watch itself, but the trade-off, in theory at least, is that it gives you that all-important peace of mind. The interesting thing is that this isn't really a case, but a cover. I'd expected that I'd have to take the strap off and encase the Watch in its new rugged bed, but it just slots right on top. There are holes for the microphone etc, the screen protector is flush with the actual display of the Watch itself, and there are rubber sections to let you press the side button and the Digital Crown. The Crown is actually partly covered by the case, with only the rear of the dial free for spinning – it feels a bit like a sports car wheel, which for some reason appeals. OK, so it fits well – but how good is it for actual sport? Well, I wasn't planning on any rock climbing or kayaking, so it was hard to test the cover fully, but I'd actually be worried about doing such a thing. Firstly, despite the 'sport' version of the Apple Watch coming in an aluminium case and ion-x glass (apparently to make it a bit more durable) I've no intention of taking this thing out if I'm going to tackle an assault course. There are no good apps for triathlon, raquet sports or other more extreme pastimes either, so it's basically just a case of using the heart rate monitor to keep an eye on your calorie burn. With that in mind, it's hard to see why I'd want to cover the Watch for activities that could scuff its exterior. OK, there might be some scenarios where you'll be doing some DIY or tending to a rock collection, and in those cases the Griffin cover might come in handy. Well, except for the fact it pops off with slight upward pressure – anything getting caught below the Watch can make it fall off. The other extreme option is to have it on all the time, using the same theory as smartphone cases to keep your new timekeeping pride and joy safe. Except, well, if you're going to do that you might as well stick with a dedicated fitness watch. Many of them have similar chunky frames and can do all the same tracking and notifications – and if you want to head off to go white water rafting they won't skip a beat. Maybe if the Griffin case gave proper water protection, or at least kept all the metal covered, this would be an easier sell, but this doesn't feel in the same league as the brand's other rugged products, which would pretty much ensure your smartphone was the only thing to survive the apocalypse. The best moment came when someone asked which smartwatch I was wearing and I showed them I was just protecting the Apple Watch. They looked at me like I was a bit mad. I fully expected this column to be all about my experiences with watchOS 2 from Apple, the new platform that enables the Apple Watch to run native apps. This is a big move forward as it means you can free yourself from your phone on a run. Download some music and podcasts, pair some Bluetooth headphones and load up Strava, Nike+ or Endomondo and you'll be away. Except despite the new OS being available for a week or so, there's still no sign of the expected slew of app upgrades, meaning I'm still stuck with a choice between using the Watch Workout app, which is frightfully basic, or keeping my phone in my pocket when I want to go for a quick trot. (As I'm writing this, Runtastic's free app has finally been upgraded to do this, and make use of the heart rate monitor, but that's the only one I've seen so far). Due to the fact that the Watch's heart rate monitor is still rather erratic, I'm not a fan of using the timepiece for running anyway (although I can pair a chest strap, which really helps matters. It's just that dedicated sports watches can do the same thing and are miles more efficient). But I still believe Apple (or another brand that makes a popular smartwatch) can rip huge market share from brands like Garmin, Polar or TomTom. The sheer variety of apps, from running to workout to sleep tracking, will always eclipse the built-in options, and when smartwatch hardware gets the same sensors to work with, it'll be hard to see who will stick with the more dedicated devices.